Optimization deals with selecting the best option among a number of possible choices that are feasible or don't violate constraints. Python can be used to optimize parameters in a model to best fit data, increase profitability of a potential engineering design, or meet some other type of objective that can be described mathematically with variables and equations. Two popular numerical methods for solving linear programming problems are the Simplex method and an Interior Point method. There are at most 5 units of Product 1 and 4 units of Product 2. Product 1 can be sold for 100 and Product 2 can be sold for 125. The objective is to maximize the profit for this production problem. 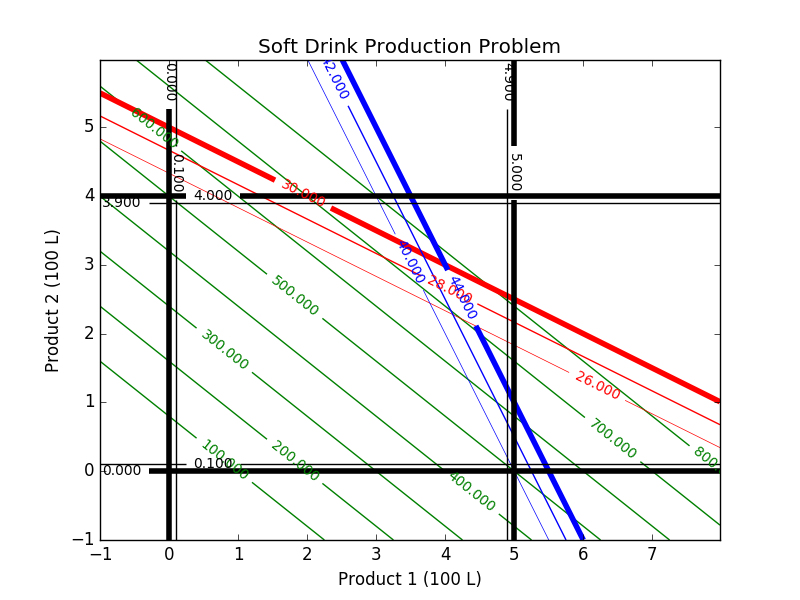 A contour plot can be used to explore the optimal solution. In this case, the black lines indicate the upper and lower bounds on the production of 1 and 2. In this case, the production of 1 must be greater than 0 but less than 5. The production of 2 must be greater than 0 but less than 4. There are at most 30 units of A and 44 units of B ingredients that are available to produce products 1 and 2. Below are the source files for generating the contour plots in Python. The linear program is solved with the APM model through a web-service while the contour plot is generated with the Python package Matplotlib.